The Ocean 66 Super Sport is a modern 4 stateroom, 4 head layout with a fully air-conditioned enclosed flybridge and a full beam master mid-ships stateroom. Her advanced hull design is far superior to the earlier Ocean builds, and the beauty and grace of her lines creates a modern contemporary look that is sure to please. Powered by the legendary, (low hour), Caterpillar 3412 engines she boast speeds in excess of 30 knots with remarkable fuel efficiency. Owner has reduced the price to effect an immediate sale. 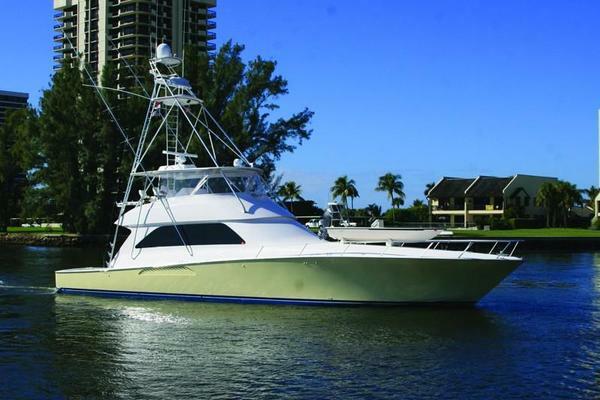 West Florida Yachts would love to guide you through a personal showing of this 66' Ocean Yachts 66 SS Enclosed Bridge 1998. This yacht for sale is located in Saint Petersburg, Florida and priced at $389,000. For a showing please contact us by filling out the form on this page and we will get back to you shortly! 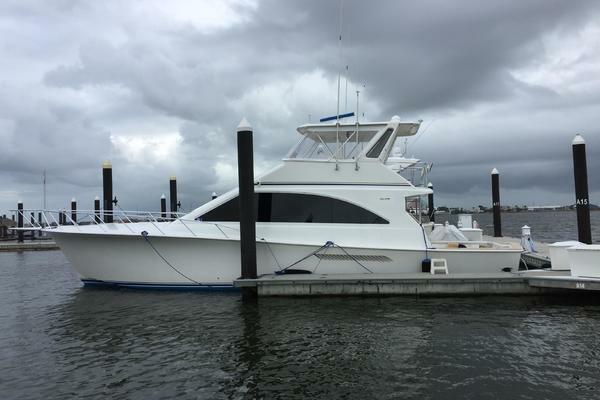 Featuring a 4 Stateroom, 4 head layout with her galley opened to the salon, and a spectacular air conditioned enclosed flybridge, this cruising convertible has the accommodations of a large motor yacht, and the performance of a tournament fisherman. Recent upgrades include all new wall to wall carpeting and teak-vinyl flooring in galley and all A/C systems serviced and upgraded. The salon features a massive leather U-Shaped sofa to port with great visibility through the large windows. There is a wet bar and cabinetry to starboard, and a concealed TV and entertainment center forward to starboard. The galley is forward and has been opened to the salon by removing a portion of the bulkhead. This has created a much better social area and has connected the galley to the salon. There are Corian style counters and a a large double door refrigerator/freezer with high end appliances. Across to starboard is a large dinette that can easily seat 6. Going below one finds 4 staterooms and 4 heads. Master stateroom is full beam and amidships with a large queen-sized berth and head with a very large shower stall. Forward to port is an over-under berth stateroom, with head and shower. To starboard is another over/under stateroom and another head and shower. Forward is the VIP stateroom with a large double berth and a separate head and shower in the fore peak of the boat. There is an apartment sized stacking washer and dryer in the companionway to the staterooms. Engine room access is from the cockpit through the tackle center. The flybridge has a modern, wide, gentle sloping ladder from the cockpit. The tournament style helm station is aft with good cockpit visibility and double ladder back helm chairs. Forward is guest seating with ability to seat a dozen people comfortably. There is a full wet bar, folding table with counter and refrigerator with ice maker on the bridge. Aft of the enclosed bridge is a small observation deck with a backing station overlooking the cockpit. Galley up to starboard with new teak vinyl flooring, custom cut down counter top forward to salon and 6 place dinette to starboard. Teak decking and cap rail in the cockpit have been removed and refinished with Non-Skid Awl-grip. Single 50 AMP 220V shore power cable. Electronics are flush mounted on helm and there is an overhead electronics box. Engines received all factory updates in 2006 By Fort Lauderdale Cat Dealer. This is the perfect blend between the spaciousness of a motor-yacht, the performance and sea keeping of a tournament fisherman, with modern design and fuel efficiency. Always a Florida boat with no damage history, Miss Jeanne Sea is a great opportunity for someone seeking a versatile all around yacht with a great engine package and a very good turn of speed. Current owner has placed the boat on the market at a price to sell.